Yes! We would be happy to send you complimentary cards as you require to distribute throughout your organization and share with your patients, employees, members, or customers. Copyright 2017 | All Rights Reserved | Rx America Save This is not insurance - Void where prohibited by law. 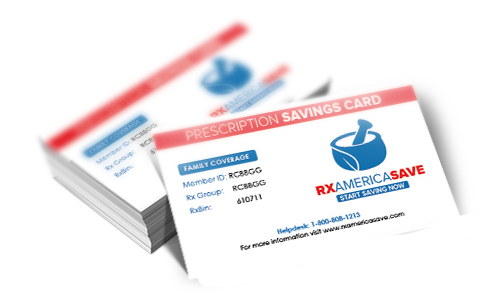 By using the card, you agree to pay the entire prescription cost less any applicable discount. Savings may vary by drug and by pharmacy. The program administrator may obtain fees or rebates from manufacturers and/or pharmacies based on your prescription drug purchases. These fees or rebates may be retained by the program administrator or shared with you and/or your pharmacy. Prescriptions purchased through this program will not be eligible for reimbursement through Medicaid, Medicare or any other government program. This program does not guarantee the quality of the services or products offered by individual providers. We do not sell your personal information. Call the member toll-free number on the back of your ID card to file a complaint related to this program.